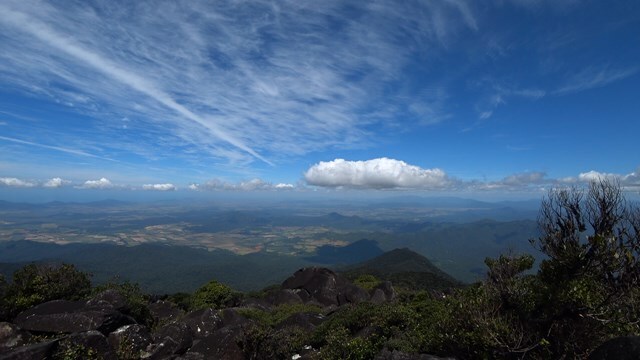 Mount Bartle Frere is Queensland's highest mountain. The eastern approach is a serious undertaking - after the Hannel Spur route up Mount Kosciuszko (1,800m elevation gain), it has the second most elevation gain of any summit in Australia (1,500m). Objective hazards include the boulder field below the summit which, due to the fact that orographic lifting means that the summit spends the majority of time in the cloud, is usually wet and slippery. Head north up the Bruce Highway from Townsville to cairns and 15 minutes after passing Innisfail you come to Miriwinni, turn off near hear and follow the signs to the Josephine Falls National Park. No good ones found - the National Park leaflet (Josephine Falls Section) and the Bartle Frere summit section leaflet. 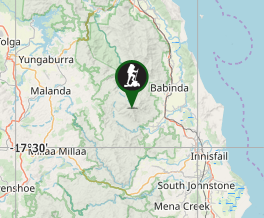 You can download a map from QTopo website (Queensland Government website for topographic maps - http://qtopo.dnrm.qld.gov.au/desktop/ - which does show the trail on it, or you can order a topographic map from www.cartodraft.com.au for approx. $10 (order map for Bartle Frere section) but this does not show the trail on it. The walk should only be attempted in the "dry" cooler months of August to October. 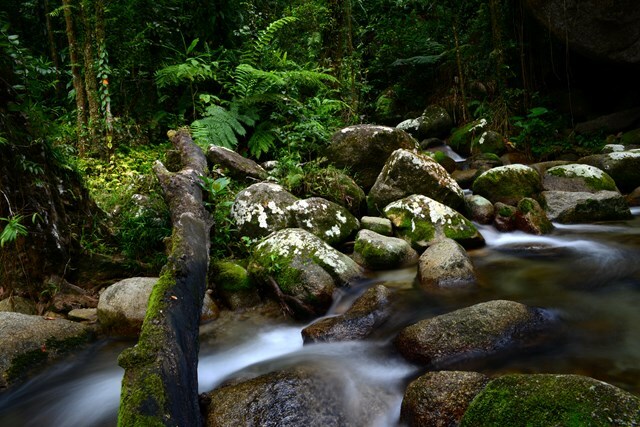 It is the wet tropics so expect to get wet. 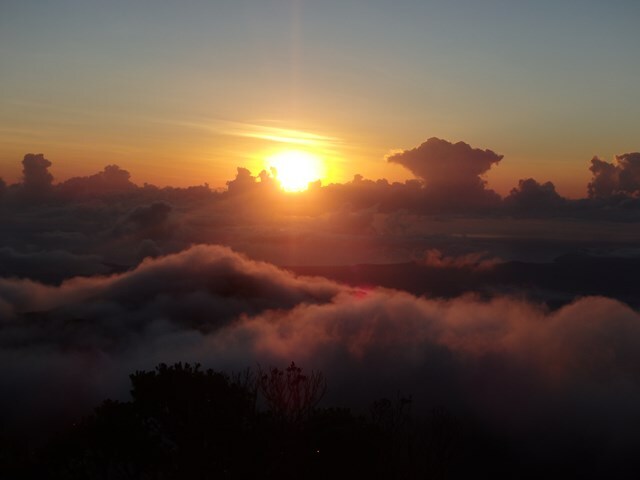 The summit is usually only visible for 5 - 10% of the year with the rest of the time being shrouded in cloud. Start the walk as early as you can, you don't want to be returning in the dark. It is possible to camp on the mountain, but you'll have to carry all your gear. the lighter your pack the easier it will be. 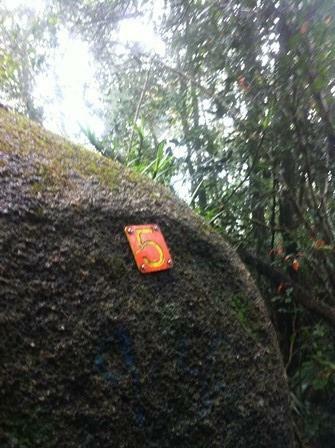 There are two main sections to the track, in the rainforest and above the rain forest in the boulder field. The rainforest section is wet muddy and steep and probably accounts for about 2/3 of the track and you get no views through the thick trees. The boulder field is very open and exposed, but provides excellent views over the coast (depending on the cloud cover). There is a marked track through the field and ladders and chains in places to assist. There is also a helicopter pad due to the high number of rescues over the years. At the summit there is a 10 minute climb through some thicker trees obscuring the view where the sign is indicating the summit. There are several other routes including one to Broken Nose. Free! - but you'll pay for a few days after with sore legs. make sure you let someone know where you are going and register in the book at the start of the track and also when you return. 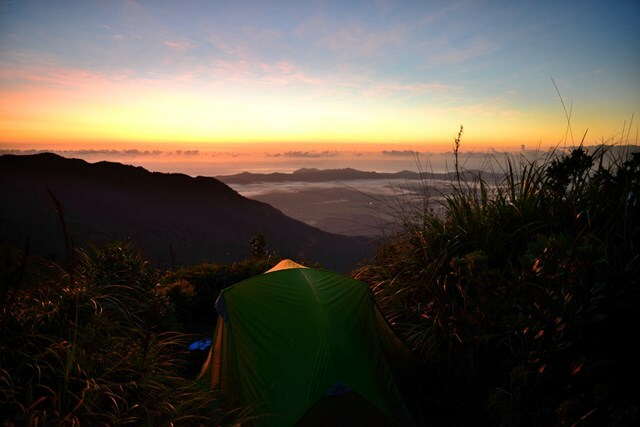 If you wish to camp, a camping permit is required for a small fee of $5.25 per night. You can order by phone or online at Department of National Parks, Sport and Racing (DNPSR). Josephine Falls Solo start at 6:30am, Summit 11:15am, back down 3:30pm. Light rain clouded summit. Loads of leeches and slippery boulderfield. Tried 2 days earlier with my brother but couldn't cross the river at junction point for broken nose/summit, days of rain had really flooded the river. All in all tough climb drank about 3.5L of water, which was all I took and a 400g bag of roasted cashews. Definitely take some deet, was using bushmans 80% plus 75g tube. A fairly hard climb especially at the top in the boulder fields. I did this walk early September on a Sat and had a nice clear day. It was 27oC at the bottom but needed a thick fleece at the top as it did get cold. No view from the summit but great views from the boulder field below. Passed about 17 climbers of which 10 were camping overnight at the top, which would have ben interesting as there wasn't a huge amount of space to pitch a tent. Took me just over 10 hours to go up and down. Had no issue with leeches. Drank about 3.5 litres of water in all and wish I had more. No place to fill up your water bottle after the 2km mark. Six of us left at 5.15am with torches and stars in the night sky, but the rain settled in by 9am. We made the rescue hut by 11am but passing from there over the boulder field to the summit and back again (approx ~400m) took nearly an hour. In the rain the boulders were slippery and dangerous. We ate and rested in the hut - nothing to see but cloud and rain. Left at 12.15 and made it back in record time 3.15pm - a 3 hour descent! 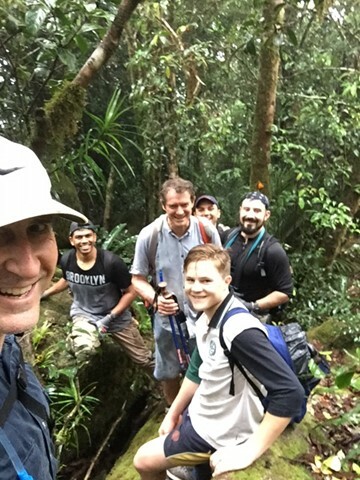 The trek was a great adventure - much of the track is truly beautiful, but if its raining wait another day if you can, as the mud, leaches, treacherous boulder field and lack of view detract from just how great a hike this could have been. Solo trip, 10.5 hours return day trip in the cloud/rain, zero views. Boulder field tricky in the wet, a billion leeches too. Glad I've ticked it off the list, but not one I'll be doing again! Definitely try for a dry day if you can - it's a choice between leeches and none. Did this one (after ditching the first leech-laden attempt and coming back on a dry day) over a solid 10 hours. 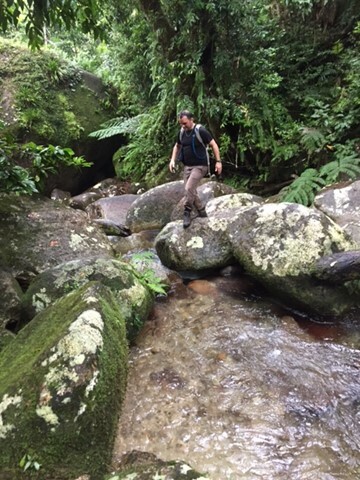 Plenty of creek crossings to start with, and towards the top the walk opens up into a grand boulder jungle, well kitted with hand-holds/foot holds where needed. Shorter people and kids might need a bit of a hand in some parts though. Did this with my 15yr old daughter. First 4k is moderate. Kms 4 - 6.5 is hard (ie slightly harder than Walsh's Pyramid), but don't let this get inside your head, it gets better. Kms 6.5 - 7.5 is back to being uphill but okay. At a steady walk, we started at 23min Kms, then slowed to 37min kms, then went back to 23min kms. There is a boulder field before the top which again, slows you down, and another steep bit before the top, but you're not gong to turn around with 500m to go. (GPS had this down as 8.1km to the top) The best views are at the boulder field, in fact getting to the top is a bit of an anticlimax. We did this walk in early July, Zero Leeches, but we did use some 'Bushman's' etc on socks and shoes before leaving. Starting temp was 13 degrees, I only needed a long sleeve T-shirt for the entire day. Despite being winter, I still drank 2ltr of water, you'd have to take double that in summer for sure. Next time I'll take some bicycle gloves as the rocks, trees and roots etc that I used for 3rd contact points started to get a bit rough on the hands. 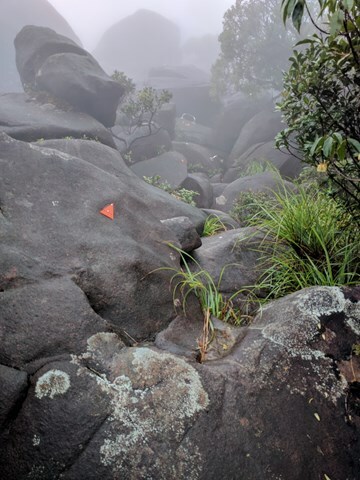 In researching this trek before going I was concerned about how long it would take me, a lot of feedback recommends two days: - The trail is better than Walshes Pyramid - and if you are from Cairns, is of a similar quality to the Blue Arrow. My daughter and I are of above average fitness, but not elite. We got to the top in 4 hours fairly comfortably. Obviously coming back down is a bit quicker depending on the state of your knees. This is the best hike I've done and the view is worth the climb. 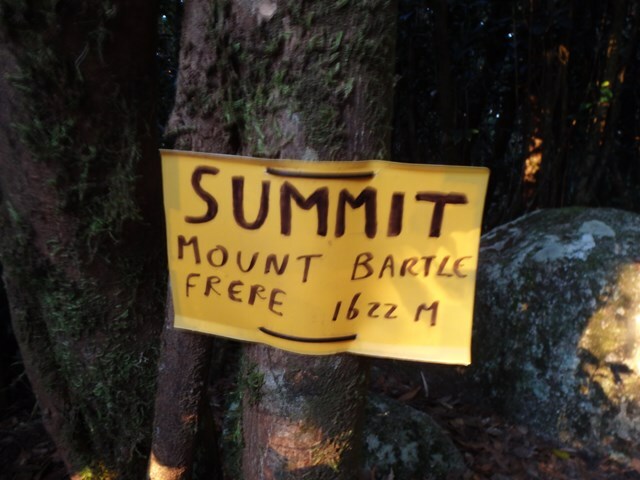 Climbed to Bartle Frere summit - 7hrs return (solo). 4hrs up, 2.5hrs down, with half hour at the top. Going up was a slog, but the track is really engaging due to its various obstacles. Descending was much easier, managed to race down the track - couldn't feel my legs at the end, and knees hurting, but overall was well worth it. I did this walk solo over the weekend with a full pack (approx 15kgs) from the Eastern approach and camped overnight at Eastern camp. The walk up is steep but not technically difficult. Took me (a moderate paced walker) approx. 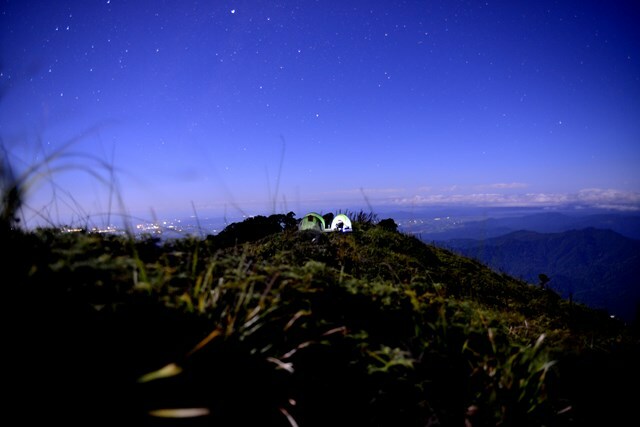 6 hours to reach the camp then another 45 mins to the summit. From this direction water is an issue. 2 hours in you will come to a creek crossing with plenty of water, but there is nothing after this. I carried 3 litres from here which was not really enough. I would recommend 5 litres minimum (unless you are continuing through to Western camp, apparently there is a creek here with water). Eastern camp has amazing sunrise/sunset views!!! Warm throughout the day but quite cold during the night (needed to use thermals and down sleeping bag). Great walk and worth the effort to carry tent/food for an overnight stay :) was lucky with the weather though, no rain! That was wonderful, had clear skies at top, what a view, very tough climb this one. Met some fast packers along the way, lightweight definitely the way to go. If you camp at helipad still try to be minimal weight, it makes a difference. Can recommend this one. A decent slog to the top, but the bouders up to the summit are well worth it! A lot of fun. Small leeches so carry some salt. Great hike! Lots of rainforest for the most. Section of ferns at the heli pad and lots of boulder climbing to the summit. did this in 5hrs 39minutes from josephine falls car park to the summit and back to the carpark (where i collapsed, exhausted!!! ), including 10minutes for a photo, drink & snack at the summit.. beautiful clear day before i left and when i returned but as other comments mentioned it is very cold at the top (which is nice because the leeches die off, after being present and annoying for almost the entire hike) once you get to the open area & closer to the boulders.. ive done a few around australia and i think this is one of the more challenging of the higher summits..kosciuszko is literally a walk in the park compared to Bartle Frere! if your lucky you will get some fresh water in the creek at the fork but nothing after that so take plenty.. always looking for other hiking partners in the area or happy to give advice on hikes ive done so get me on fb... search my name Lincoln murdoch... cheers and happy hiking! Very hard going the area has had a lot of rain recently and washed the track out in places. Gradient would average 4:1 and in a lot of places near vertical with us having to drag our self up with exposed tree roots. The leaches were of proportions I have not seen before in my life and were a constant irritation, this walk is not for the faint hearted. We took the eastern approach and reached the summit in 6 and back down in 4. could be done faster if I was not coming of a week of flu sickness leading up to the walk. 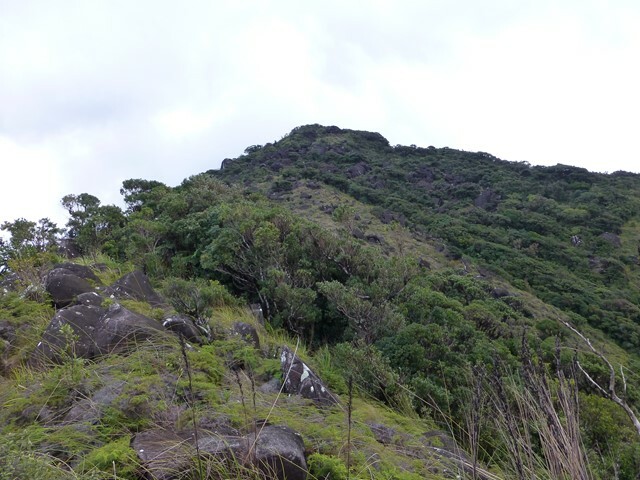 A very hard steep walk or climb. Pity there are aids to climbing now. Spectacular views at top. Well worth it second highest ascent in Australia. Mind you the leeches are vicious! I think this is when I did it. 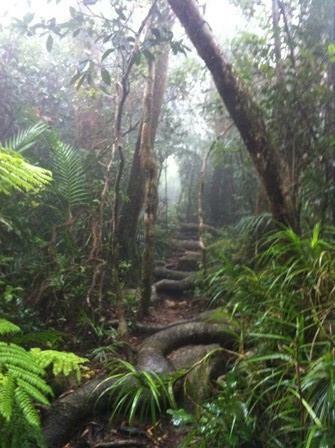 Check the track condition prior to going as there has been heaps of rain in recent years! A wet cold climb in cloud. 24c in the forest but dropped to-2c on the boulder field. Very slippery on way down. Especially around the part where you down climb the roots of the tree. No views but very proud that I climbed it! Beautiful, A tad dangerous after all of the rain...... Josephine Falls was amazing and absolutely gushing.